2016 is a special year for Dunelm Geotechnical and Environmental Ltd, as we celebrate our 50th Anniversary. We are taking this opportunity to reflect back on where we have come from, and the challenges and successes that have shaped us into the nationally successful company we are today. Dunelm has established itself as a market leader, surviving three economic recessions by providing a quality product and service to all its clients. The company continues to expand and looks to the future offering investigation services to the rail industry and opening a new office in Manchester. Throughout its fifty years Dunelm continues to investigate the past for your future. 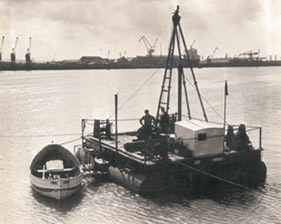 Dunelm was founded in 1966 by Gerry Wright, Gerry Ward and Alan Ward who saw an opportunity in the ground investigation industry after the closure of Holt’s Well Drilling. 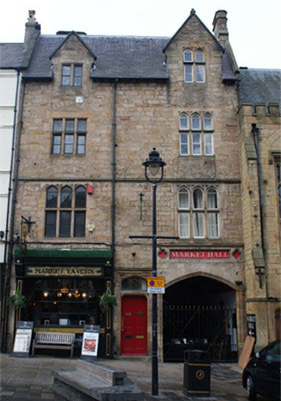 Dunelm Drilling was originally located in a small office above the Market Tavern Pub (Fig.1), with a drilling yard at Waddington Street in Durham. Dunelm has always remained within County Durham moving to Sherburn Hill then to Hetton le Hole before establishing its office in Meadowfield in Durham. Dunelm faced many challenges during the late 1960’s and early 1970’s due to the downturn in the construction industry. However circa 1972 Dunelm went on to win a £300k ground investigation contract with Esso in Teesside (Fig.2), establishing Dunelm as one of the leaders in ground investigation in the North East. In 1992 the company was bought out by Nigel Coultas the Managing Director of Nax Engineering, he invested in the technical staff and capabilities of Dunelm allowing the business to maintain and win many term contracts with leading house builders, supermarkets and local councils. Gary Dresser a geotechnical engineer with over 25 years’ experience in ground engineering was offered the opportunity to buy Dunelm in 2004. Gary has used his technical expertise, drive, enthusiasm and customer focus to expand the business and provide a comprehensive ground investigation service. The company offers both in-house drilling services and a dedicated team of geotechnical and geoenvironmental engineers providing technical knowledge and ground investigation solutions. Gary Dresser a geotechnical engineer with over 25 years’ experience in ground engineering was offered the opportunity to buy Dunelm in 2004. Gary has used his technical expertise, drive, enthusiasm and customer focus to expand the business and provide a comprehensive ground investigation service. Ann is an engineering geologist who has extensive experience in providing advice on site investigations and geotechnical and environmental engineering design solutions for major derelict land reclamation, commercial and industrial development, and waste management schemes. Her experience includes providing technical advice on earthworks, geotechnical design, environmental assessment, developing remediation criteria and reclamation strategies addressing contamination, ground and surface water remediation and waste management.